The Samsung Galaxy Note 8.0 is not just a direct iPad mini competitor, it is also a Note device and that means it supports the S Pen and the apps that come with it. We took a quick look at the way the S Pen works on the Note 8.0 and were overall impressed with its pressure sensitivity and Samsung’s interface tweaks to accommodate the pen functionality into Android. We fired up the S Note application and you can see our quick demonstration of all the features bundled with it right below. The S Pen itself is the size we’ve come accustomed to - not too thick or long, but still fairly convenient to use. It has a single physical key that allows you to switch between different modes very conveniently so for example you can switch between drawing and erasing in a single click. Just as with other Note devices, whenever you take out the S Pen out of its slot, the tablet automatically switches to the relevant apps. And for all the rest of the little details around the S Pen and S Note on the Galaxy Note 8.0 take a look at our video right below. I see a speaker.... OH MY GOD.... THAT THING CAN MAKE PHONE CALLS?!?!?! u see thats one of the most greatest features of Sammy tabs! 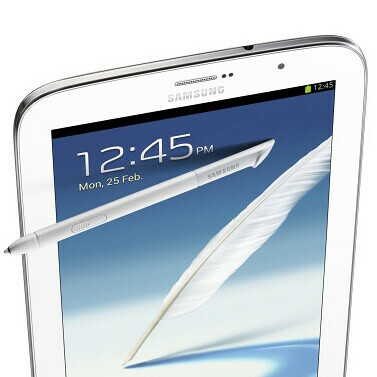 i have Note 10.1 3G and its awesome at making calls! i actually use it a lot! It depends where you live; from what I've read elsewhere, it will be Wi-Fi only in the U.S. and will not have calling capabilities. If the price is right (and that would be $300) this is a good device, if it's more expensive, no reason to go for it over the soon-FHD Nexus 7 or the Nexus 10.